PPS School: Scoil Mhuire, Strokestown, Co. Roscommon. Ladies Gaelic Football Achievements: Club: U-14 Div.1A 2007, Minor Div. 1A 2009, 2010 and 2011, Junior B league 2008, junior B championship 2009, Junior A league 2009, Junior A championship 2010, Intermediate league 2010, Intermediate championship 2011. County: U14 B Connacht final 2007, U14 B All Ireland finalists 2007, U16B Connacht final 2008, U16 B Connacht final 2009, U16 B All Ireland finalists 2009, Minor B Connacht final 2010. Schools: Connacht final 2007, Junior A Connacht final 2009, Senior C Connacht final 2010 and All Ireland runners up 2010. Connacht All Star 2011 Number 11. When did you start playing Ladies Gaelic: Age 4! Favourite Sporting Moment: Winning our third county minor title in a row. Biggest Disappointment: Never winning an All Ireland Gaelic title. 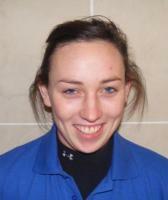 Favourite Ladies Gaelic Players: Sinead Aherne, Dublin. Most embarrassing moment on or off the football field: Hitting the cross bar four times in our Connacht Club semi final against Drumcliffe this year. Ladies Gaelic Football Skill: Taking points from a distance. One rule you would change in our game: Ban picking the ball straight off the ground. Influences on your career: Family, sister, The Sunday Game, enjoyment had by playing the game.